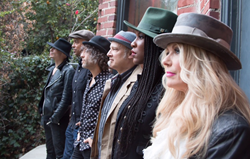 Nancy Wilson, one of the founding members of the Rock and Roll Hall of Fame group Heart, has teamed up with former Prince band member and R&B singer Liv Warfield to form a new super group called ROADCASE ROYALE. The sound of ROADCASE ROYALE is muscular rock with some R&B/Blues and in depth ballads thrown in, reflecting the iconic sounds of both their respective bands. ROADCASE ROYALE’s debut song is available to stream now via the band’s Soundcloud page. The song, “Get Loud,” is a ROADCASE ROYALE original, and "will debut January 20th immediately following Concert for America: Stand Up, Sing Out! ", which will be livestreamed through Facebook. The song will also be featured at the Women’s March on Austin, TX (the largest ever gathering of Texas women) on January 21. Joining Wilson (guitar) and Warfield (vocals) are lead guitarist Ryan Waters (the musical director for Liv’s solo work and Prince protégé) along with Heart members Chris Joyner (keys), Dan Rothchild (bass), and Ben Smith (drums). Each of the members’ musical talents shines in “Get Loud.” The song begins with a laid-back groove, providing a solid acoustic and electric foundation for Warfield’s vocals – all about getting loud and standing up for women’s equality. “Get Loud” blends this important message with the group's R&B and rock influences, resulting in a uniquely powerful track. "Concert For America: Stand Up, Sing Out!" is a star-studded benefit concert highlighting the diversity and hope that is America at its best. Brought to you in association with Broadway Cares/Equity Fights AIDS, proceeds will go toward national organizations dedicated to civil rights for all and protecting the environment. The concert will take place at The Town Hall in New York City on January 20th, at 3:00 PM, and will be livestreamed on Facebook. Celebrities scheduled to appear include Betty Buckley, Sharon Gless, Andrea Martin, Jessie Mueller, Bebe Neuwirth, Rosie O'Donnell, Rosie Perez, Billy Porter, Chita Rivera, Brian Stokes Mitchell and more!